In this volume, Jin Young Choi provides an alternative understanding of discipleship in the Gospel of Mark. Using the hermeneutics of phronesis, she offers a fresh interpretation of three passages, Mark 6:45-52, 7:24-30, and 7:31-37. 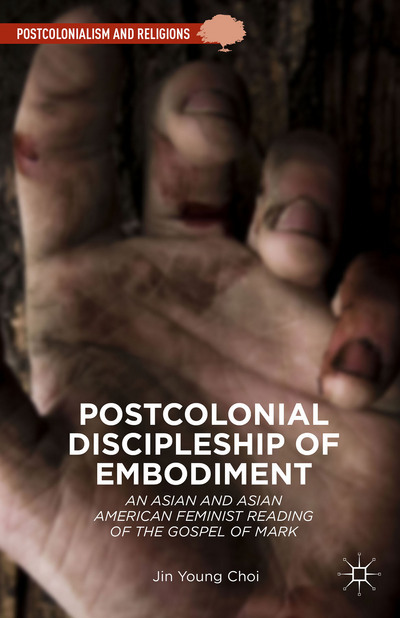 The key contribution of her work is the interweaving of Asian and Asian American women’s context with the Gospel of Mark and its imperial setting, giving insights both to biblical scholars and postcolonial and/or feminist researchers. Her provocative rereading of the text also calls on traditional readers of Mark to engage in the mystery of Jesus’s broken body rather than to privilege scholarly objectivity. Part I is devoted to establishing the methodology of her work. Choi begins by calling into question the traditional interpretations of Mark, in which “christology and discipleship have been central” (1). According to this dominant Western perspective, true discipleship, which Jesus’s disciples seem to fail to achieve in the narrative, requires a precise understanding of Jesus’s identity. Choi, however, suggests that “such interpretations are a scholarly construction in the context of the Enlightenment” that highlights “an individualistic quest for knowledge” (1). Rather, disciples should embody the incomprehensible mystery by partaking of Jesus’s, broken, disfigured, and humiliated body. Chapters 2 and 3 delineate the author’s alternative approach to Mark. Drawing on three frameworks, i.e., postcolonial studies, feminist studies, and postcolonial feminist studies, Choi articulates the hermeneutics of “phronesis” or “embodied wisdom” (30-31). She considers this act of interpretation “a tactic of minority people” (38), which can be found both in the text of Mark and in the context of Asian and Asian American women. In chapter 4, the beginning of part II, Choi provides key topics centered on “body, territory, and language” in the Roman imperial context (47), which she subsequently explores in connection with three Markan passages. In chapter 5, the author argues that the phantasmic body of Jesus in Mark 6:45-52 reflects early Christians’ traumatic experience of Jesus’ passion, death, and ultimately, absence. Yet the haunting presence of Jesus as “a repressed past not captured by historical consciousness” (79) destabilizes the Roman imperial presence. In chapter 6, which deals with Mark 7:24-30, Choi interprets the borderline encounter of Jesus and a Syrophoenician woman, both colonial subjects whose encounter represents the “transcorporeality and transterritoriality” of Jesus’s body (101). Symbolized by bread, Jesus’s body is thus distributed and fed to “ochlos-minjung in Mark” (98). And the marginalized Gentile woman asking Jesus for giving “the children’s crumbs” (Mark 7:28) in order to heal her demon-possessed daughter represents the embodied wisdom or tactic of the oppressed. In chapter 7, Choi associates the impaired speech of a man in Mark 7:31-37 with the repression of the Roman Empire, which often silenced and feminized the linguistic Others. The passive man in this periscope, who is healed by Jesus’s “somatic engagement” (125) but paradoxically speaking “without any words” (109), resonates with the experiences of Asian Americans, on whose bodies “the dominant forms of culture and language practice are imposed” (128). Though their voices are hardly heard, Asian Americans disrupt the dominant system by “using the master’s language” (130). As Choi admits in the conclusion, her work is still an ongoing process: Asian and Asian American feminist hermeneutics could be advanced in ways that overcome binary oppositions between “the West and the Rest” or “the Self and the Other” and that continues dialogues with other minority groups (135). In addition, I suggest that two aspects would deserve further consideration: 1) First, a great weight of her interpretations occasionally seems to depend on disputed aspects of the passages. For example, Choi relies on a controversial reading of a word in Mark 7:24 (methoria instead of horia) when she explains the significance of the borderline encounter in Mark 7:24-30. Additionally, whereas a creative interpretation of elalei orthos in Mark 7:35 as “speaking rightly without any words” strongly supports her association of the mute man in the pericope with the linguistic Others in the United States, the reading itself may be disputable. 2) Secondly, since her hermeneutical tactic synthesizes several frameworks rather than relying on a single methodology, it could seem complicated to readers less familiar with such diverse theoretical models. It is somewhat ironic that a discipleship through embodied wisdom and participation in the mystery requires another type of sophisticated theoretical exploration. Despite these points of consideration, I would find this book greatly insightful, persuasive, and transformative not only for Markan scholarship and researchers of cultural studies but also for theologians and ministers who hope to engage with the biblical texts from their specific contexts in a lively manner. Moving back and forth between ancient and modern contexts as well as among several hermeneutical frameworks, Choi’s work adroitly incorporates her personal and communal experiences into the world of the Gospel. It is a gospel in which marginalized subjects encounter, touch, and partake of the broken, but life-giving body of Jesus through the discipleship of embodiment.